Whether you like the spa look of rolled towels, or just neat stacks, these ideas are sure to please. 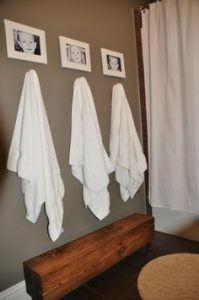 One of the easiest ways to display towels is to place them on a hook like a locker room. The nice thing about this option is that anyone can hang a towel on a hook, including children so you don’t have to worry about perfectly folded towels. 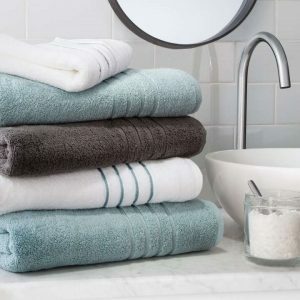 Folded and stacked towels are a great option. 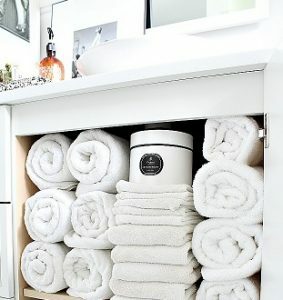 You can fold towels in half or thirds for your stacks and place on an open shelf for easy access. 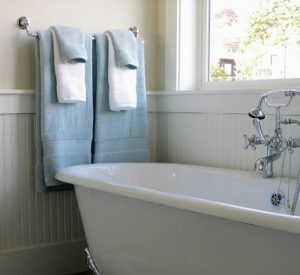 Roll your towels and place on a shelf if you like a spa look. This is a great space saver and looks very decorative. 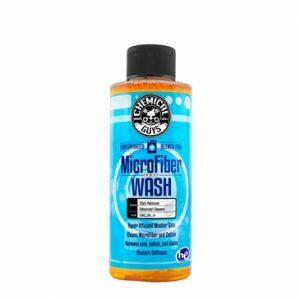 It’s super easy to roll your towels, so this is a great option for saving space while looking great. Layer your towels for easy use. This option is pretty self explanatory. 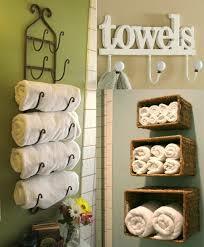 Simply fold your towels neatly and layer on top of each other over towel rack. 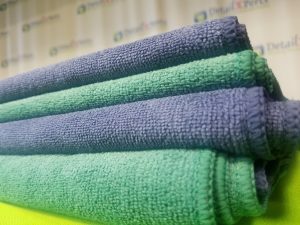 I like to layer a bath towel, hand towel and wash cloth. 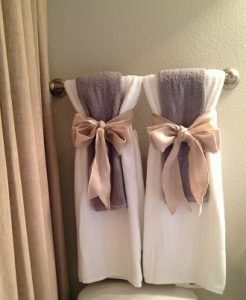 Group your towels with a ribbon for a chic look. It’s also a great way of saying, “hands off” if you don’t want someone to use a particular set of towels. Decorative holders are super great because they can be useful as well as decorative. You can even find towel holders that have a built in shelf. 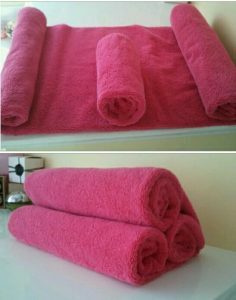 Fold your towels into fun shapes like a resort. You can find lots of towel folding tutorials on-line from pretty shapes like fans, baskets and animals. 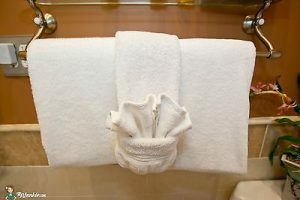 Add a touch of decorative decor to your towels by embellishing with elements from your decor. This bathroom has a nautical theme so the starfish is the perfect piece of decorative decor. 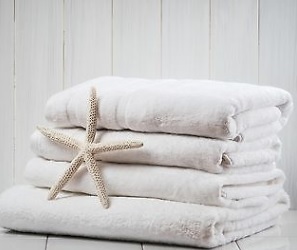 It’s easy to add the shell to a simple stack of towels.